Egyptian police general assassinated in an attack claimed by the Al-Qaeda inspired group Ansar Bayt al-Maqdis. A top Egyptian police general was assassinated on Tuesday, an attack claimed by an Al-Qaeda inspired group which threatened similar attacks against the army chief and interior minister. AFP reported that General Mohamed Saeed, an aide to interior minister Mohamed Ibrahim, was gunned down as he left his home in a west Cairo neighborhood on Tuesday morning. Claiming responsibility in a statement posted on a jihadist website, the Salafist Ansar Ansar Bayt al-Maqdis said it carried out the killing. Addressing Ibrahim and army chief Abdel Fattah al-Sisi, the group warned, "Vengeance is coming." The interior minister was already the target of a failed assassination attempt claimed by the group last September in which a bystander was killed. Ansar Bayt al-Maqdis has claimed most of the deadliest attacks in Egypt since the army's overthrow of Islamist president Mohammed Morsi last July, saying that they were in revenge for a deadly crackdown by the security forces. Morsi's Muslim Brotherhood, which renounced violence decades ago, has condemned the attacks but that has not stopped it being declared a terrorist organization by the military-installed authorities. The blacklisting makes even declarations of verbal support for the Brotherhood punishable by heavy prison sentences. Ansar Bayt al-Maqdis also claimed responsibility for a Monday attack on Egypt's gas export pipeline through the Sinai Peninsula. The attack on the pipeline was the third in less than a month and follows repeated attacks last year that severely disrupted Egypt's gas exports. 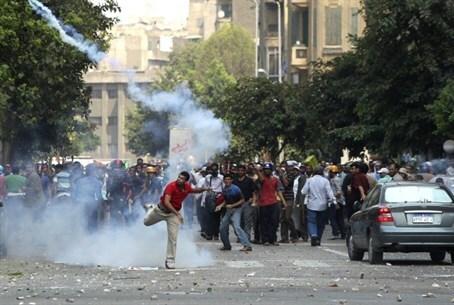 The group had previously claimed a car bombing which killed five people outside Cairo police headquarters on Friday. The group has in the past also claimed rocket attacks on the Israeli resort city of Eilat.